I live in the mountains of western North Carolina (US) and work as a freelance editor of nonfiction. The latter was preceded by two lengthy stints as a systems engineer in the telecom industry. I have written and self-published several books and ebooks (one on bridge, the remainder on chess) and have recorded several digital audio tracks. 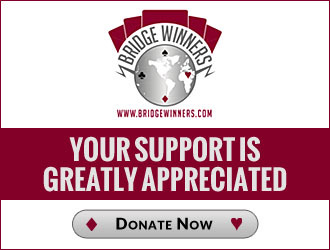 I last played bridge in 2007. Effective October 29, 2016, I will try to consistently use the gender-neutral Swedish pronoun "hen," which means "he or she" or "him or her," and the gender-neutral Swedish pronoun "hens," which means "his or her" or "his or hers." What is the true source of this deal? How Many IMPs Do Your Agreements Gain? How Do You Take This 2♠ Advance? Deal w. Kaplan (♠QJ10 ♥Kx ♦AQJxx ♣Q10x) & Kay? Does Chess Mastery Foretell Bridge Knack? Defensive Bidding Scheme: "Cooperative Slam Lightner"